I’ve written quite a bit about how terrible it makes me feel when I read about parents losing their children. The number of babies and young children who died from disease or accidents before the mid-20th century is appalling. But in the story of the family of Leopold Nusbaum, I saw a different type of tragedy recur a number of times: young children losing a parent. That pattern began with Leopold Nusbaum’s own daughter. Leopold Nusbaum had died in 1866, predeceased by his four year old son Adolph and survived by his widow Rosa and daughter Francis. Francis was only sixteen when her father died. Francis had married Henry Frank in 1870, and in 1880 they were living with her mother Rosa and their three children, Leopold (named for his grandfather), Senie and Cora, in Lewistown, Pennsylvania, where Henry was a merchant. Their fourth child David Henry Frank was born in April 1884. By 1884 the family had returned to Philadelphia, where Henry was in the cloak manufacturing business with a firm called E. Rubel and Company. The family was residing at 1234 Marshall Street. Rosa Nusbaum, Francis’ mother, died February 16, 1887, in Philadelphia. 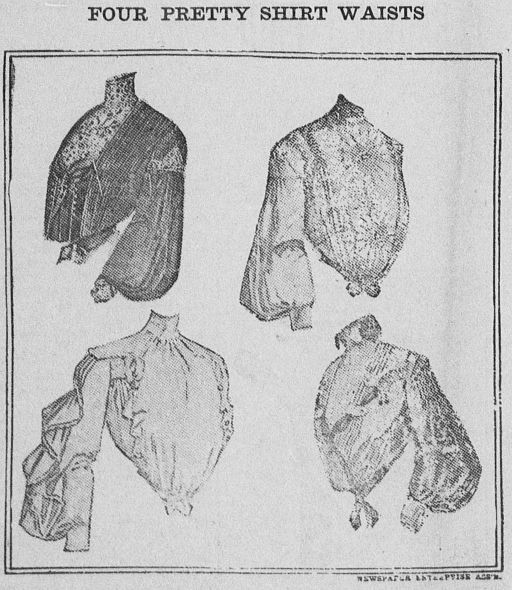 By 1889 Henry was with a new firm, Patterson, Frank, and Company, still manufacturing cloaks. By 1894 he had his own firm, H.N. Frank & Co., and the family had relocated to 1633 Franklin Avenue. The children were now growing up: Leopold was 23, Senie was 18, Cora was 17, and David just ten years old. By 1899 they had relocated again to 2351 Park Avenue, and Leopold was now a salesman in his father’s business. The 20th century saw the children of Francis Nusbaum and Henry Frank beginning to move on as adults. In 1901, Senie married Joseph H. Hinlein. Joseph Hinlein was a widower; his wife Clara Falk Hinlein had died at age 29 from an aneurysm in June, 1900, leaving Joseph with three young children: Florette, Stanley, and Milton. When Senie Frank married Joseph Hinlein, she thus had an instant family. Joseph Hinlein was a manufacturer. In 1900 the census merely says he was a manufacturer, but in 1910 it says braids and in 1920 ladies’ trimmings. I assume the braids were decorative trimmings for women’s clothing. There are some very strange things about the census records for Joseph and his children. For one thing, Joseph’s birthplace varies widely from census to census: Germany (1900), Pennsylvania (1910), Wisconsin (1920 and 1930), and Ohio (1940). His passport application in 1946 lists Prairie du Chien, Wisconsin as his place of birth as does a ship manifest from 1928 for a trip he took with Senie. Was this evidence of the unreliability of the census reports or of Joseph himself? A little more digging, and I found Joseph on the 1870 census when he was just a baby, living with his parents in Prairie du Chien, Wisconsin. That census indicated that Joseph and his parents were born in Bavaria. Did Joseph forget where he was born in 1920 and thereafter? Or was he lying to be more American? Or perhaps the census taker in 1870 was mistaken or misunderstood where the baby in the home was born. But there are other strange things about the Hinlein family and the census. Although Milton is consistently reported as born in September 1895, Stanley is reported as born in 1893 on the 1900 census, but on every document after that his birth year is generally about 1900. When I found his World War I draft registration, I thought—Aha! That will have his birthdate. But it was blank except for his name. And Florette’s age is also mysterious. On the 1900 census it says she was born in December 1898 and only a year old. But in 1910 she is seventeen years old, meaning a birth year of 1892 or 1893. Every other census is consistent with the earlier birth year, and her Social Security death index entry and her headstone say she was born in 1892. Plus she married in 1913; it seems more likely that she was 21 than 15 when she married. When I examined the 1900 census more closely, although it clearly says December 1898, the “1” for her age could easily have been a “9.” Maybe the census taker changed the birth year when he thought that she was one, not nine, years old. During the 1910s, the three Hinlein children were moving out on their own. As mentioned above, Florette married in 1913; her husband Jerome Lehman was from New Jersey, and Florette and Jerome settled in Newark, New Jersey where Jerome, a graduate of Princeton, was working in his father’s food business in 1917, according to his World War I draft registration. Jerome and Florette had one child, a daughter who was born in 1915. By 1920 they were living in West Orange, New Jersey, and Jerome was now the vice-president of the grocery business. Florette’s brother Stanley graduated from Princeton University in 1922 (when he was either 22 or 29, depending on which birth year is correct) and also married Beatrice Silverman in Philadelphia that year. Stanley followed his father Joseph into the braid manufacturing business. He and Beatrice settled in the Philadelphia area and had a daughter in 1925. The third Hinlein child was Milton. He married Reta Greenwald in 1919. They also settled in Philadelphia. I need help deciphering Milton’s occupation on the 1920 census. I think it says “—- trimmings,” so I assume he also like his brother went into his father’s business. Milton and Reta would have three children in the 1920s. Senie’s younger sister Cora Frank had married just two years after Senie. She married Jacques Jacob Gattman in Philadelphia in 1903. Jacques was born in 1875 in Mississipppi where his father, a native New Yorker, was a banker. By 1894, however, the family had relocated to Philadelphia, as Jacques’ father is listed in the Philadelphia directory for that year as a malt merchant. On the 1900 census, Jacques is living with his parents and working as a salesman. After marrying in 1903, Cora and Jacques settled in Philadelphia and had a daughter Dorothy in 1905. Then at age 31, Jacques died from cerebral apoplexy or a stroke on January 19, 1906. Cora was a 29 year old widow with a baby less than a year old. Her daughter Dorothy, like her Hinlein stepcousins, lost a parent at a very young age. Cora and Dorothy moved back into Henry and Francis Nusbaum Frank’s home at 2351 Park Avenue, where Cora is listed as residing in the 1908 and 1909 directories as well as on the 1910 census. Cora remarried in 1913. Her second husband was Joseph Gustav Lehman. I immediately thought that there had to be some connection between Joseph Lehman and Jerome Lehman, who married Florette Hinlein, Cora’s stepniece, that same year. I have yet to find that connection, however. As noted above, Jerome Lehman was born in New Jersey in 1896, and his father Leser Lehman was also born in New Jersey. Joseph Lehman, on the other hand, was born in Ohio in 1876, and his father Gustav was born in Germany in about 1845. Could there be a connection? Of course. But I have yet to find it. Joseph Lehman was 37 when he married Cora; she was 36. They settled with Cora’s daughter Dorothy in Dayton, Ohio, where Joseph had lived his whole life. His father Gustav was a dealer in hides, and in 1900 Joseph was working as a bookkeeper. 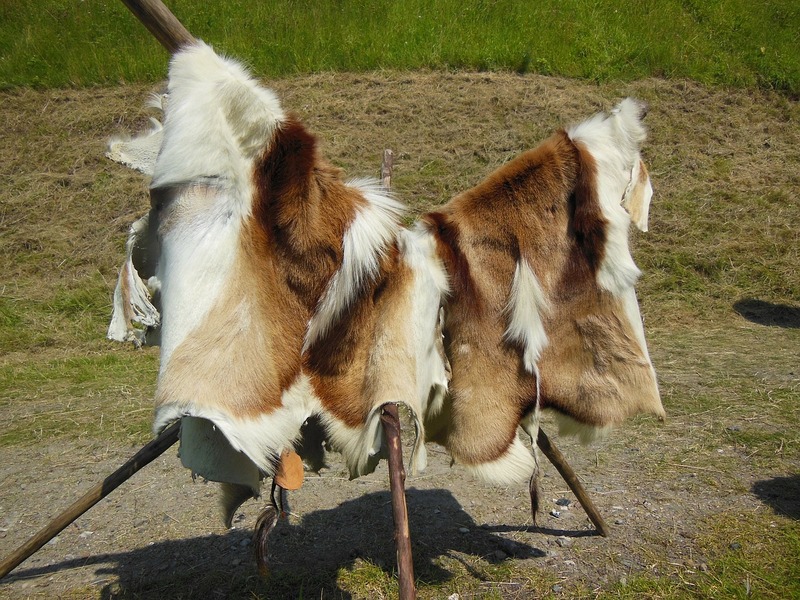 By 1910 his father had died, and Joseph and his brother Jacob had taken over the hides business. After marrying Cora in 1913, Joseph became the secretary of the Hewitt Soap Company, according to his World War I draft registration in 1917. The 1920 census lists his occupation as secretary of a steel company. The transition from hides to steel is a telling one, revealing the shifts in the US economy by 1920. Dorothy, now a teenager, was living with Joseph and Cora. Unfortunately, I have been unable to locate Dorothy after 1926 when she was listed as Dorothy Gattmann and as a student in the Dayton city directory. I cannot find her as Dorothy Lehman or Dorothy Gattmann. I assume that she married and changed her name, but I don’t know where she lived or who she married. David Frank, the youngest of the children of Henry and Francis Nusbaum Frank, also was married by 1910. He married Rhea Heilbron, who was from Reading, Pennsylvania. They had been married a year at the time of the 1910 census and were living in Philadelphia. David was working as an inspector in a suit factory. By 1920 they had relocated to New York City where David was now working as a wholesale merchant in “waists” or women’s clothing. David and Rhea did not have any children. The last of the Frank children to marry was the oldest, Leopold Frank. In 1910 when he was 38 he was living at home and working with his father in the clothing business. On his passport application dated April 25, 1914, he described himself as single and residing in Philadelphia and a cloak and suit manufacturer. I cannot locate him on the 1920 census (perhaps he was overseas), but on a June, 1921, ship manifest he is listed as residing at 601 West 115th Street in New York City. Then, in 1925, Leopold shows up on the NY State census, living with his brother David and sister-in-law Rhea and married to a woman named Nellie. David and Leopold were both working as dress salesman. For a long time I could not figure out when Leopold had married Nellie or anything about her life before 1925. But then I looked over everything again and found some clues. Also living with David, Rhea, Leopold and Nellie Frank in 1925 was a nineteen year old young man named Raphael Austrian, identified as the nephew of the head of household, that is, David’s nephew. At first glance I had assumed that this was Rhea’s sibling’s child since the last name, Austrian, did not match any of David’s siblings. But when I later searched for some history for Nellie on familysearch.org, looking for a woman born around 1885 in Hungary, the first name on the search results list was a Nellie Austrian from the 1905 NY State census. I almost dismissed this listing because it said Nellie was married. But when I looked back again at the 1925 NY census and saw Raphael Austrian again, it clicked. Nellie Austrian was the woman now married to Leopold Frank, and she had a son Raphael who was the nephew of David Frank, the head of household listed in the 1925 census. So I went back to research Nellie as Nellie Austrian. On the 1905 census, I found that Nellie was married to an American-born publisher named Julian Austrian. Further searching for Julian Austrian (thank goodness for some unusual names) revealed that he was born in Reading, Pennsylvania in 1876. In 1900, he was still single and living in Reading. I was then able to find him and Nellie and Raphael on the 1910 census living in New York City and also on the 1915 NYS census. Julian’s World War I draft registration reported his occupation as editor and publisher of the F. Stallknecht Publishing Company, and googling that name revealed that they were engaged in the business of trade publications, for example, for the fur trade. But on October 31, 1919, Julian died of heart failure back home in Berks County, Pennsylvania. He was just 42 years old. Once again, there was a young widow, and once again, there was a young child who lost a parent. Like Francis Nusbaum who lost her father Leopold when she was 16, like the Hinlein children who lost their mother Clara when they were younger than ten years old, like Dorothy Gattman who lost her father Jacques before she could even know him, young Raphael Austrian lost his father when he was only fifteen years old. 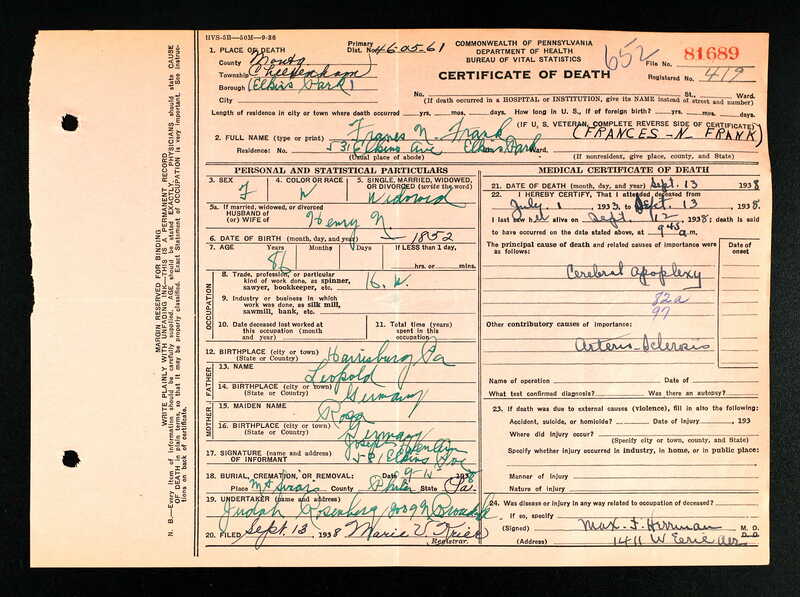 In 1920, a year after Julian Austrian died, Raphael and his mother Nellie were living in New York City with a woman named “Diona” Wolkenstein, listed as Nellie’s sister, and from that census entry I finally learned what Nellie’s birth name was, Wolkenstein. Nellie herself was now listed as a publisher. I then searched the NYC marriage records for a bride named Nellie Austrian and found one entry for September 30, 1922. 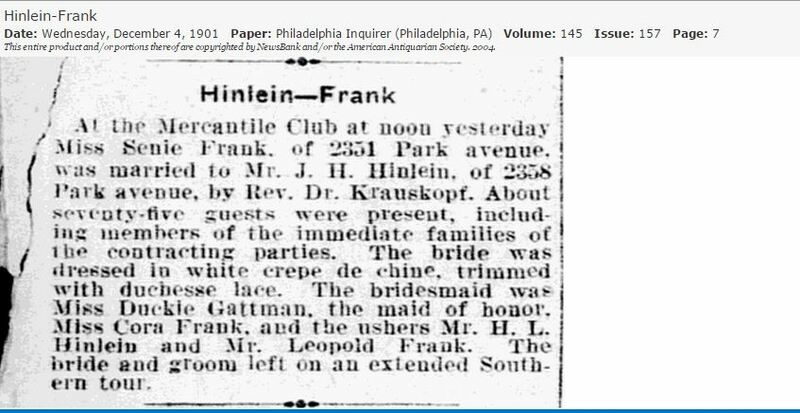 Although the groom’s name was not included in the index, this obviously had to be Nellie’s marriage to Leopold Frank. Even after marrying Leopold Frank on September 30, 1922, she continued to use the name Nellie Austrian in her listings in the New York City directory as a publisher. Looking back again at the 1925 census, I now realized that David and Rhea Frank not only had Leopold and Nellie and Raphael living with them; Nellie’s sister “Diona” (indexed as “Siona” here, but more likely “Ilona”) Wolkerstein was also living in the household. By 1925, all four of the children of Francis Nusbaum and Henry Frank were thus finally on their own. Senie was living in Philadelphia with her husband Joseph Hinlein, and her three stepchildren were all married and out of the house. Cora and her husband Joseph Lehman were living in Dayton, Ohio, and her daughter Dorothy was a student. David Frank and his brother Leopold Frank and their wives were living in New York City where David and Leopold were apparently working together in the dress business. Their father, Henry Frank, died June 18, 1925, of heart disease. He is buried at Mt. Sinai cemetery. By 1930 Francis Nusbaum Frank, now a widow, had moved in with her daughter Senie and son-in-law Joseph Hinlein in Cheltenham, outside of Philadelphia. Her daughter Cora and her husband were still in Dayton, Ohio, and Joseph was now in the airplane parts business (maybe the same as the 1920 company, but I cannot tell). The 1933 directory lists him as the treasurer of the United Aircraft Company, as does the 1936 directory. Cora’s daughter Dorothy Gattman was no longer living with her mother and stepfather. As of 1930, David and Rhea Frank were still living in New York City, and David was still in the women’s clothing business. In 1930 Leopold Frank and his wife Nellie were also still in New York; Nellie was still a publisher, and Leopold, like his brother David, was still selling women’s clothing. In November, 1935, David Frank died at age 53; he was residing in Philadelphia at the time and is buried at Mt. Sinai cemetery. 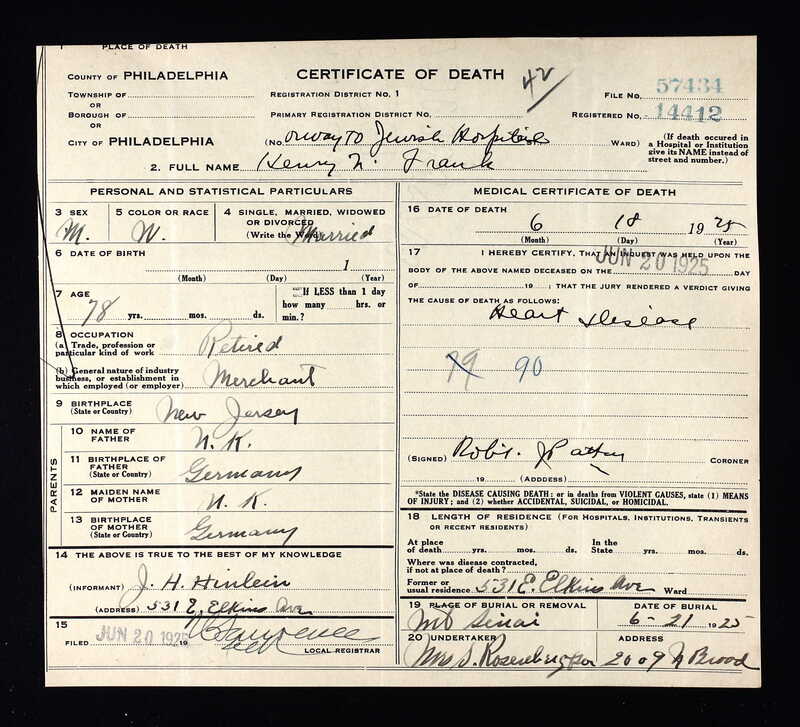 I’ve been unable to locate a death certificate for him or an obituary, but according to two family trees on ancestry, he died in Atlantic City. Rhea Frank returned to her home town of Reading, Pennsylvania, where she died seven years later in October, 1941; she was also 53. They are buried together at Mt. Sinai. After losing her youngest child David in 1935, Francis Nusbaum Frank died on September 13, 1938, of a stroke. She was 86 years old. Like the other family members, she was buried with her husband Henry at Mt. Sinai. In 1940, Senie and Joseph Hinlein were living with their son Stanley Hinlein and his family in Cheltenham. Joseph Hinlein died in 1950 at 81, and Senie died the following year on May 22, 1951. She was 74 and died of heart disease. She and Joseph are buried at Mt. Sinai cemetery in Philadelphia. Their three children all lived long lives; Florette died in 1993 at 100 years old. Stanley died in 1983 at 90, and Milton died in 1982 at 87. Cora and Joseph Lehman were still in Dayton in 1940, and Joseph was the treasurer of an aircraft company. The last record I have for them is a record of Joseph’s death on June 14, 1959. Cora was still alive at that point, but I have no further record for her or for her daughter Dorothy Gattman. Leopold Frank and his wife Nellie seem to have disappeared after 1930. I cannot find either of them on the 1940 census. I know that Nellie’s son Raphael was married and living on Long Island in 1940, but I cannot find a trace of his mother or stepfather. Looking back at the family line that began with Leopold and Rosa Nusbaum, I see a family with a lot of tragedies. Leopold and Rosa lost their young son Adolph when he was just a little boy. Their daughter Francis had four children. The oldest three all had either children or stepchildren who had lost a parent when those children were still quite young. Both Leopold and Senie married people who had lost a young spouse, and Cora suffered the loss of her first husband at a very young age. (David had no children.) By 1940, there were no biological descendants of Leopold and Rosa living other than Dorothy Gattman, who I cannot locate. The family lines of the Hinlein children, who were raised in large part by Senie Frank and whose children undoubtedly saw her as their grandmother, did continue on, and I am hoping to find some of those descendants to fill in some of the gaps left in this story. Senie and Joseph did not have any biological children together. Since I have not yet been able to get permission from living descendants, for privacy reasons I am not disclosing the names of those born in or after 1915. Since Rhea Heilbron, David’s wife, was also from Reading, Pennsylvania, I wonder whether she was friendly with the Austrian family and thus introduced Nellie to Leopold after Julian died. This entry was posted in Genealogy, Nusbaum, Pennsylvania, Philadelphia and tagged Dayton, genealogy, Joseph Hinlein, Leopold Nusbaum, Philadelphia, Prairie du Chien, Wisconsin by Amy. Bookmark the permalink. It makes me wonder whether today’s records are any more reliable especially as it relates to immigration both legal and illegal? I am sure there are plenty of errors even today with modern technology. As they say, garbage in, garbage out. As long as human beings are entering data, there will always be errors. Could be! I would think that a new immigrant might be confused or nervous dealing with a government agent. But Joseph grew up in the US. Why would he lie? Or maybe his wife or child or neighbor gave bad information. I guess we will never know! Amy, more stellar work. I want to hear more about those books we discussed. I’ll write soon. I’ve been enmeshed in another project as my poetry book was published last Friday. Thanks, Luanne. And congratulations on your poetry book! That’s wonderful. Email me when you have a chance, and I will fill you in on the process I used.